Well…it was another day that got away. What with work and dinner and the grind, I failed to write about beaked whales. 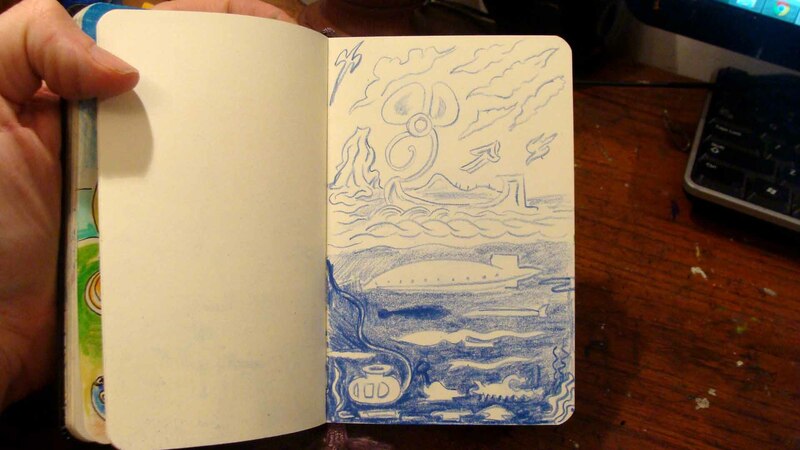 Don’t worry: those magnificent diving experts cannot escape our pen forever, but, in the interim, we must fall back on my daily doodle book (which Ferrebeekeeper cognoscenti know is a little moleskine sketch book that I carry around and draw in during my spare time). I have a big sarcophagus-shaped pencil tin too—which is full of colored pencils and markers to bring my drawings to life. The first sketch however (above) only required one “Blue Denim” colored pencil. It’s a little unclear, but I think it is a picture of the future oceans filled with bathyspheres, synthetic ocean life (to replace the fish we are recklessly killing off), and ships driven by fanciful propulsion. Synthetic beings and post-humans fly through the weird clouds of this strange ocean world. In fact, maybe it’s not Earth at all, but somewhere else entirely—an ocean world of oddly familiar alien marvels. Next is another troubling pastiche of nature and technology. A happy monster ambles by a shambling city while a gambling demon tosses dice at a magic crystal. Reptiles and weeds fill up the foreground as strange elongated opossums creep in from the sides. It’s just like now! This might as well be a CNN photo about the 2016 election. This image may need to be colored in. What do you think? Finally, thanks to enthusiastic comments from my favorite readers, I included more fruit. One of my tasks at my new day job is overseeing the fruit supplies for a big office full of desk jockeys who spend all day looking at important documents. Because of ancient precedent, almost all of the fruit is bananas, and my colleagues beg piteously for different fruit. 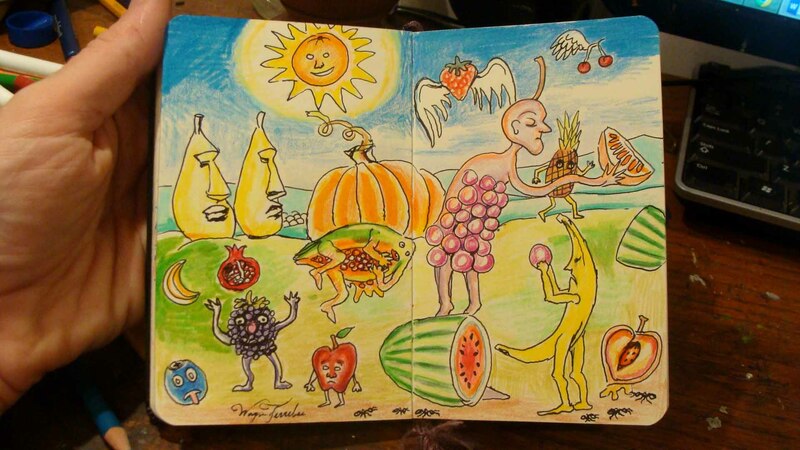 I have provided their wants…in this fantasy drawing which shows a succulent world of juices, seeds, and glowing tutti-fruit color. It could also be that there is a statement here about our world of agriculture, selective breeding, transgenic alteration, and over-consumption…or possibly it is just a fun doodle I made at lunchtime. As always, thanks for looking at my little artworks. I treasure everybody’s comments (though I realize I have been slower than usual to respond). Let’s keep enjoying the rest of summer. I’ll keep drawing (and the post about beaked whales will appear soon). Cheers! These are lovely, Wayne! 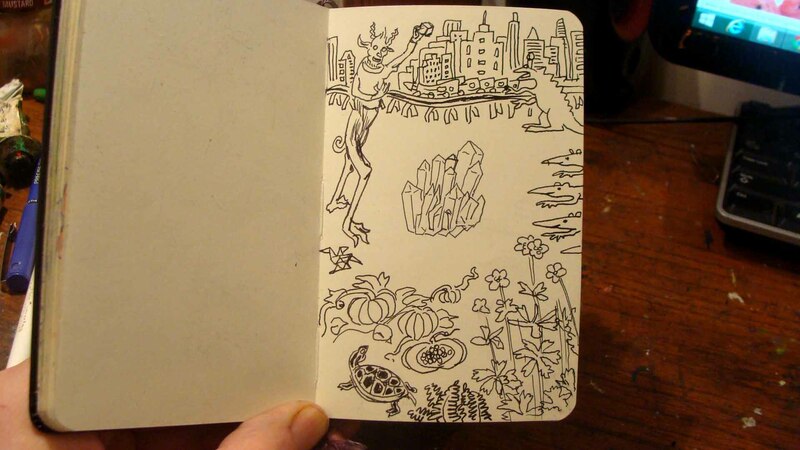 I admire how unique each drawing is – a world unto itself! Thanks so much, Emil! I’ll try to make some more little worlds. Thanks. I’ll work on it when I have a spare moment! My mine and torpedo creations would love your ocean – mmmh, targets! You seem to have progressed to considerable power – you could bring them to the point where they would do whatever for an apple. But be careful what you say about the bananas – UF doesn’t like unfaithful henchmen! I’ll have to check out your dangerous creations. Did you see today’s (September 2nd) post about killer robot submarines hunting starfish? Yes! I love it! That way the greenies will fund nice work for the first time! It’s all in the algorithms. Methinks, the neural map of a shrew would make sense in such robots!